Miss Cashy got pregnant before separating with Khaligraph Jones and killed the relationship quietly behind the scenes but now she is back in the limelight with shocking allegations against the Original Gangsta Khaligraph Jones who is expecting a baby with his girlfriend. The timing is odd. 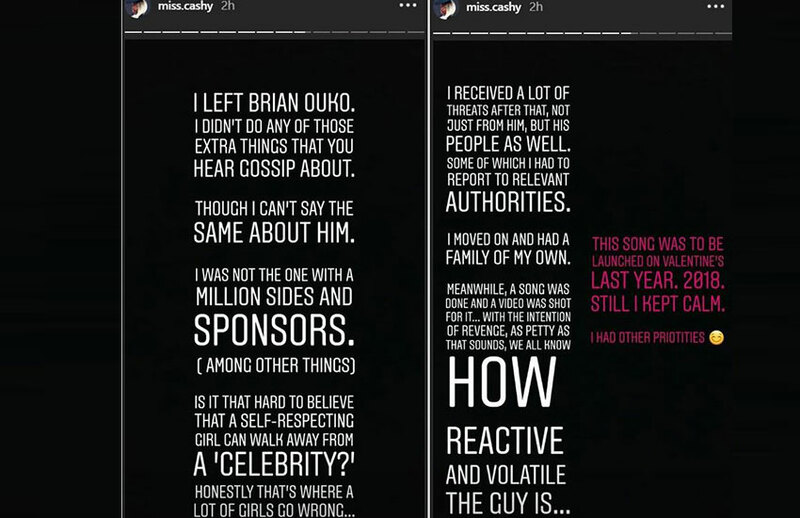 Miss Cashy went on a rant on Instagram saying she is ready to speak about why she dumped the biggest, figuratively and literally, rapper in the game, financial manipulation, physical abuse, emotional abuse, slander and threats on her life. The financial part had her followers a bit confused because Khaligraph Jones had earlier confessed on live television that he was paying Miss Cashy's school fees at USIU. It is not clear whether Miss Cashy graduated or not. Miss Cashy claims that despite moving on and having a family of her own, a bitter Khaligraph Jones clinged on her like an octopus and had his crew sending death threats to poor Miss Cashy. She even allegedly had to go to the police to report some of the cases. She describes Khaligraph as a very volatile man, always seeming to be on his periods. Miss Cashy says she is the person behind the brand(Forgive this website's Wilkins Fadhili), Respect the OGs. But now she neither respects nor calls him the OG. He is now Brian Ouko.